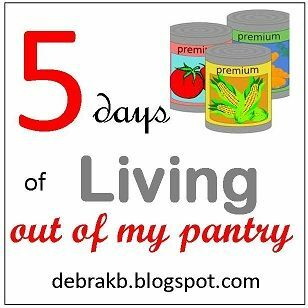 Footprints in the Butter: Living out of my Pantry: What does that mean? Living from my pantry? What does that even mean? And why would I want to? Today, I just want to define this, and if you don't already do something similar, maybe it will get you thinking about it a bit. I grew up the oldest child of a couple of war-babies. Their parents (my grandparents) were definitely shaped by their experience in the Great Depression. We grew a lot of food, and processed cases of tomatoes and pickles, along with other things. Every year, we headed to my grandparents' farm to butcher chickens, or to shuck and freeze acres of sweet corn, or to chop firewood, or to head out fishing. We'd head to my grandma's house to pick apples, which we then spent a weekend freezing. It wasn't something I thought about a lot as a kid. But I always knew that no matter what, we had chicken, corn, tomatoes, pickles, etc. in the house -- enough to last all year. And we could always bake an apple pie. One way or another, we would eat. Maybe on some level, I knew my family was a bit different. When a blizzard was forecast, my mom wasn't making an emergency run to the grocery store. We were always prepared. I have no recollection of there ever being any thought given to what we'd eat if we were snowed in for a week. That is how I've approached things too. I don't have family raising chickens (though Connor wants to start), or anyone with an extra field of sweet corn. And while we have been known to stop at a store when there is an approaching storm, that is a choice. We normally don't have to. Looking at my house, it ain't my momma's pantry. But most of the time, I know that if push comes to shove, I could feed my family through any storm. I've tested that. We've frequently had 2-3 days where we can't get out. Sometimes longer. With some (okay, a lot of) creativity, we could make it for a few months without shopping for food. At all. I know that, but I haven't exactly tested it. However, we have had seasons of life where I have drastically cut our grocery spending for months... as in $35 a week (for a family of seven)... and we have done well. It does take a lot of creativity though. How long could you go without buying food? I am certainly no expert, and I hope to learn from my readers this week too. Looking forward to chatting about living out of your pantry. I'm really looking forward to reading this series. It works in with my "Do with watcha got" attitude of frugal eating. Gotta work on stocking the pantry and cupboards to do that.